At the turn of the 20th century the German Football Association was founded and in its initial membership were no less than three clubs from Mannheim. These clubs were Mannheimer FG 1896, Mannheimer FG 1897 Union, and FC Viktoria 1897 Mannheim. In 1907 SV Waldhof Mannheim were formed and quickly became the leading side in the city. 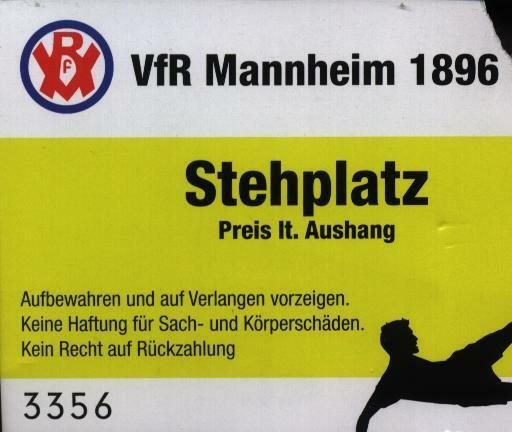 In order to compete with Waldhof the three original clubs merged in 1911 and became VfR Mannheim. VfR would become very much the contempories of Waldhof in the Nazi instigated Gauliga-Baden. Waldhof won the title in 1934, 1936, 1937, 1940, and 1942. While VfR took the title in 1935, 1938, 1939, 1943, 1944. 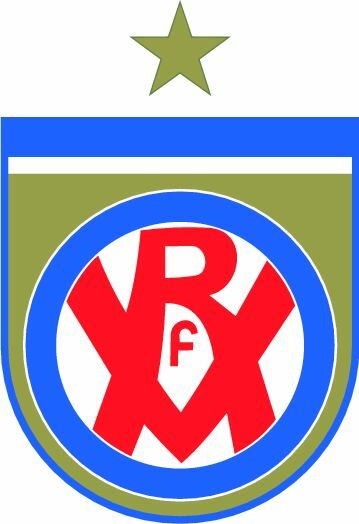 VfL Neckarau’s (a Mannheim suburb) 1941 success meant Mannheim based clubs won the Gauliga for eleven straight seasons. The fierce Gauliga rivalry was a prelude to VfR’s finest hour when in 1949 by defeating Borussia Dortmund 3-2 they won the National German Championship. The match held in front of 90,000 people saw the first awarding of the now iconic Meisterschale, the giant studded plate somewhat churlishly referred to as the salad bowl. While 1.FC Nuremberg had won the first post war championship in 1948 the new trophy was first presented to VfR Mannheim. The new trophy had become necessary after the old German National Championship, the Viktoria trophy, which had been awarded since 1903, had disappeared during the war whilst in the care of the last pre-War champions, Dresdener SC. Post German reunification the old trophy was unearthed having been buried in a pile of coal for 45 years. The 1949 title win would become the zenith of VfR’s existence. 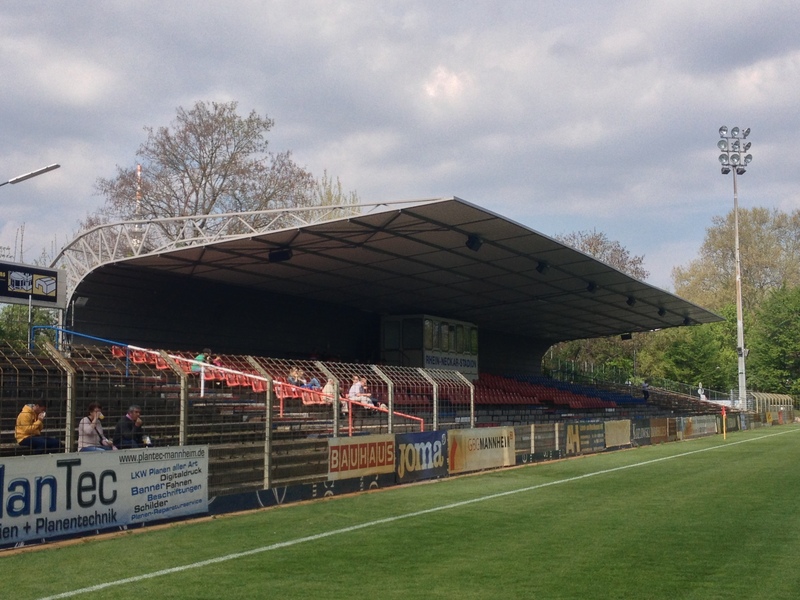 When German football was reorganised and the Bundesliga was formed in 1963, VfR were placed in the second tier Regionalliga- Süd. Ten years later VfR dropped to the third tier and began to struggle financially and rebuffed two attempts at a merger with SV Waldhof in 1998 and 2003. 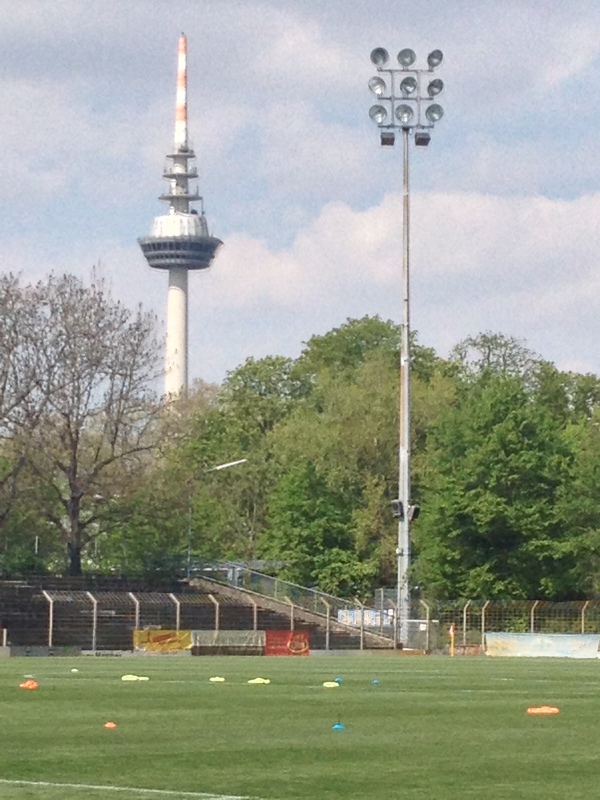 Having maintained their independence the club were denied a license and were demoted to the Verbandesliga Nordbaden. 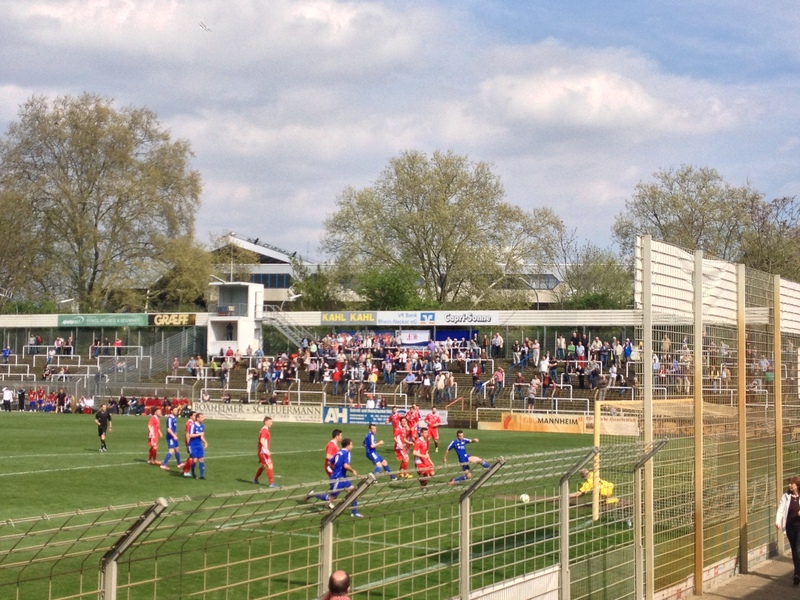 That league was won at the first attempt and VfR gained promotion to the Oberliga Baden-Württemberg where they play today despite another relegation in 2009. 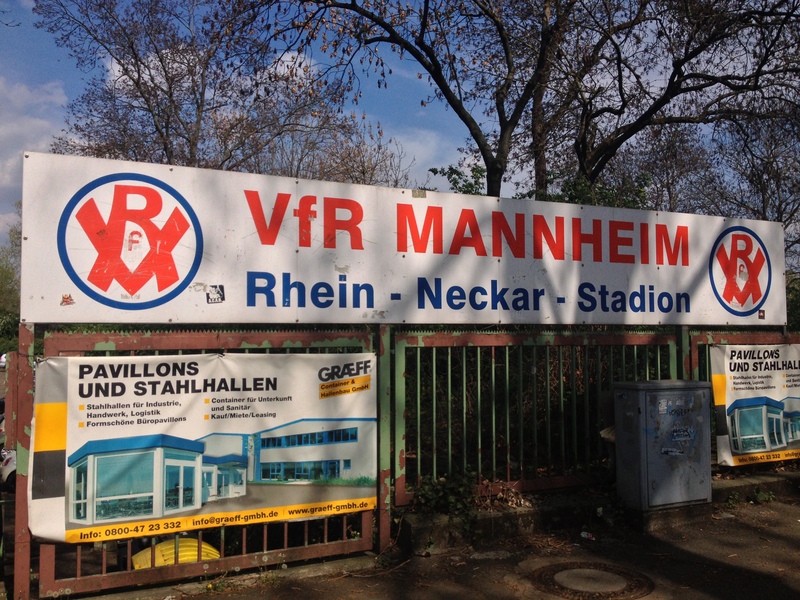 The present home of VfR is the Rhein-Neckar Stadion, not to be confused with Hoffenheim’s similarly named modern arena. 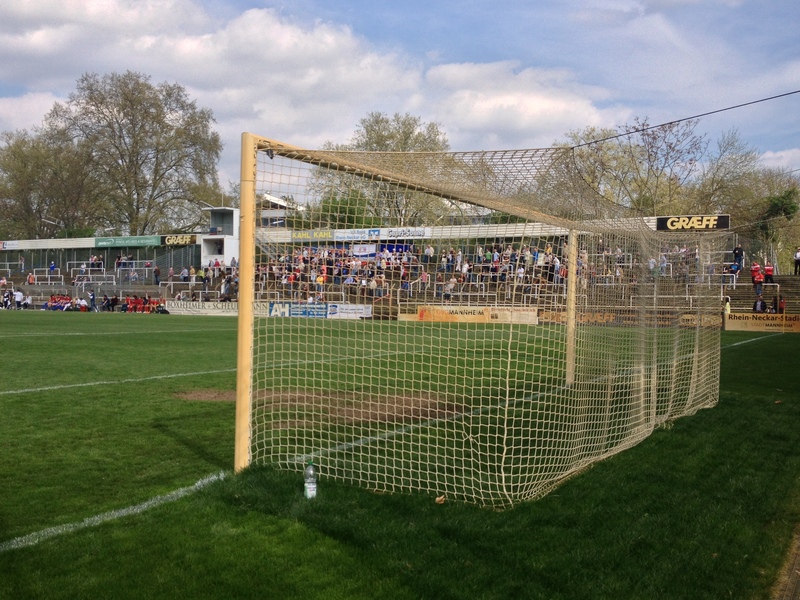 The current ground was built in 1971 next to the original Stadium Mannheim. 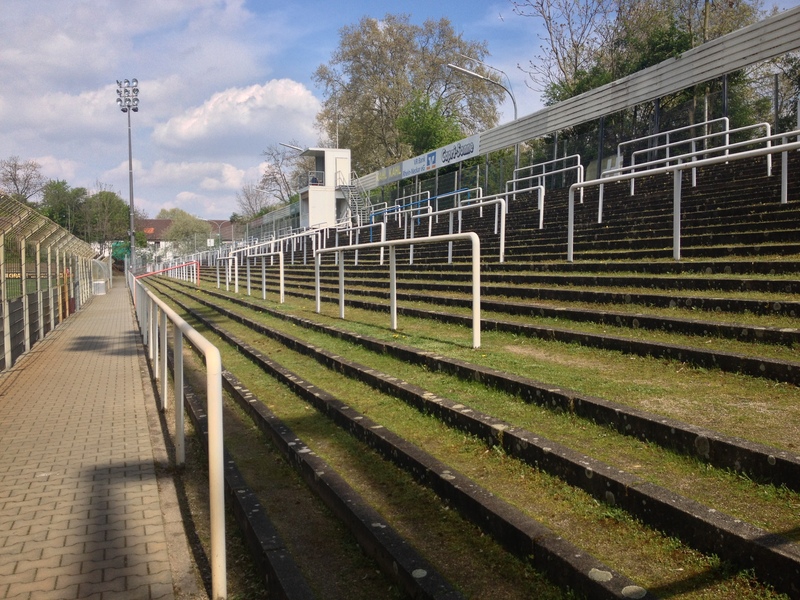 The original stadium was opened in 1927 but was cleared in 1992 to make way for the opening of the Carl-Benz Stadion, the home of long time nemesis Waldhof. The grounds back directly onto each other. 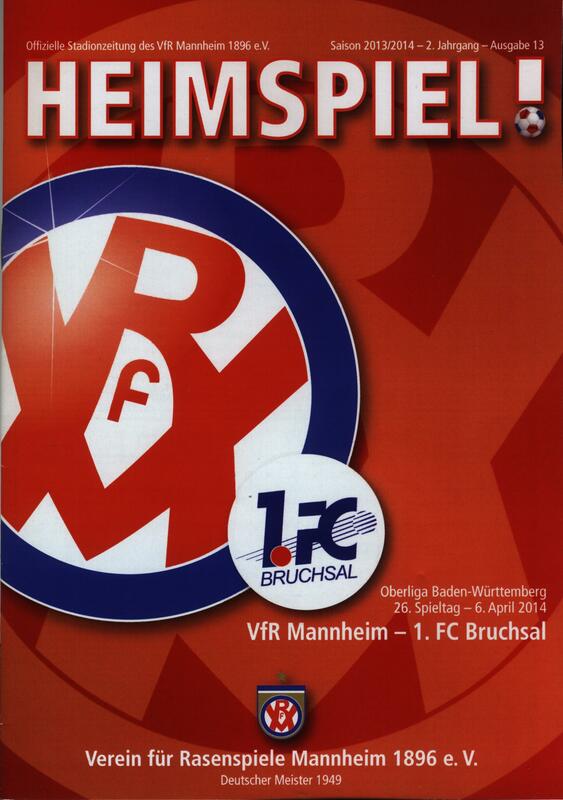 Today’s game is a real “six-pointer” the hosts lie next to bottom with 24 points while there are a clutch of clubs, including visitors 1.FC Bruchsal, have two points more, a win is vital if VfR are to stay up. The club are truly convivial hosts, offering us a very welcome beer and telling us of their fundraising attempt to buy a replica of the Meisterschale to celebrate 65 years since their finest hour. I wish them well, it was an amazing title success and sadly one they will not be able to repeat. Even in the fifth tier the club need an annual budget of 450,000 euros to field a reasonably competitive team. The hosts have a dream start when the referee awards them a penalty after just three minutes which captain Erdogdu gleefully dispatches into the net. Speaking of nets the VfR goalposts are a talking point, a sandy beige colour, like some sort of relic from Operation Desert Storm. The explanation for the colouring is due to the heavy mineral and chalk content of the local water and while the goalposts are cleaned and painted every close season, pitch irrigation sees them colourise during the campaign. While the hosts maintain the ascendancy their lead remains a fragile one until they bring on leader scorer Hans Kyei. A player of some quality he looks a threat every time he goes forward. It is no little surprise when he taps in the decisive second goal five minutes from time. The relief in the small but partisan crowd is palpable. They needed this. And we need clubs like VfR, fiercely independent, belligerent and respectful of their heritage. Wonderful stuff. 1. Levent Cetin, 2. Marvin Pelzl, 4. Norbert Kirschner, 5. Oliver Malchow, 8. Daniel Herm, 9. Kaan Erdogdu (c), 13. Manuel Morilla-Morito, 14. Eric Schaaf, 16. Marko Terzic, 20. Enis Sen, 21. Piero Adragno. Subs: 22. Robin Albrecht, 3. Dragan Peric, 7. Sven Beier (for 7,89 mins), 11. Hans Kyei (for 14,70 mins), 12. Camilo Dos Santos, 15. Peter Prokop (for 16,79 mins). 1. Sascha Rausch, 4. Isa Kaykun, 5. Jan Kahle, 6. Pavlos Osipidis, 7. Denis Schwager, 8. Marco Mayer, 9. Erich Strabel, 10. Sandio Inguanta, 16. Francisco Rodriguez Carmona, 19. Mike Weindel, 23. Georg Dis (c). 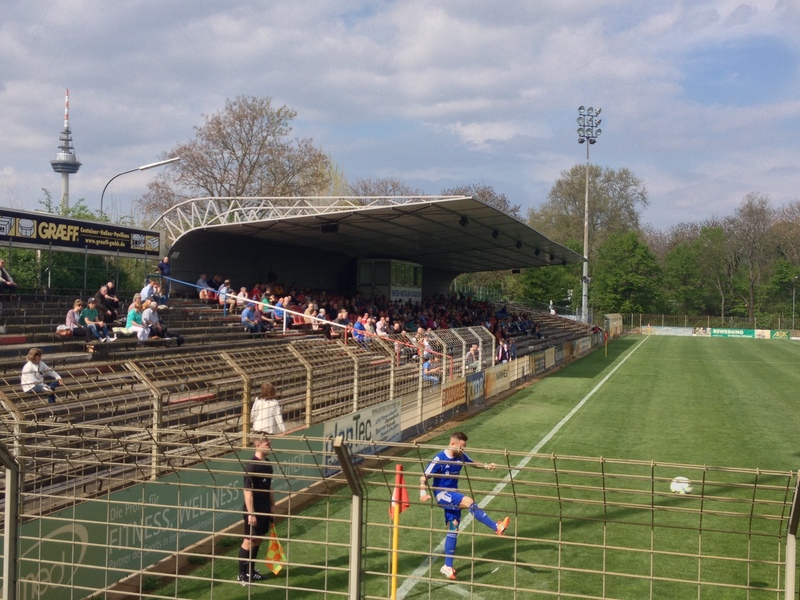 This entry was posted in Travel, Matches & Stadiums and tagged 1FC Bruchsal, German, Germany, groundhopping, Oberliga, Rhein-Neckar Stadion, VfR Mannheim by peterrmiles. Bookmark the permalink. Peter, it was a pleasure to see you in Mannheim. Just one tiny remark: The sandy beige colour of the goalposts is owing? of our water which is full of minerals and chalk. It´s like limescale? 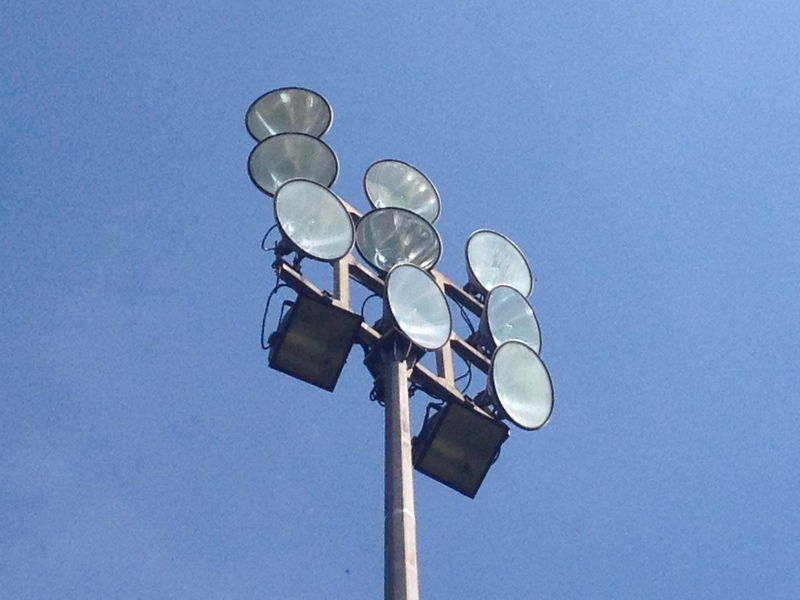 We have to clean it every year and starting season even the goalposts are WHITE again. 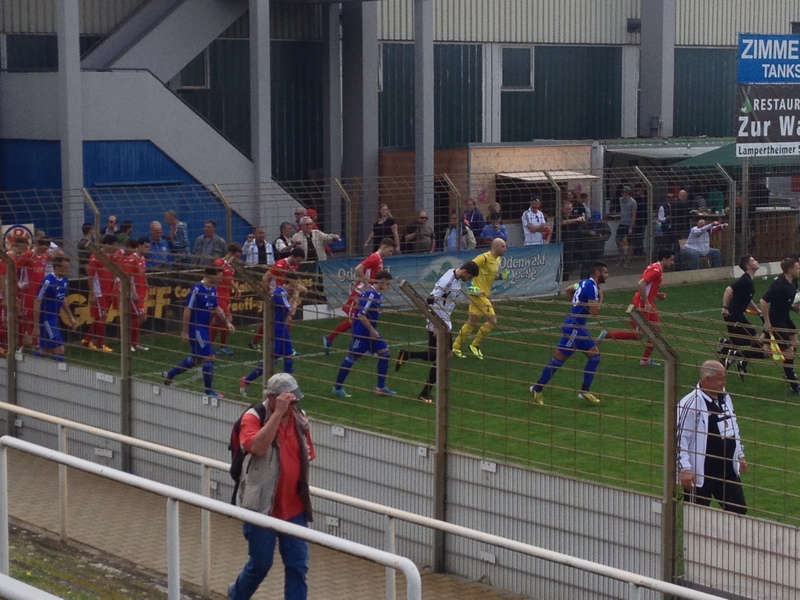 Two corrections: The rival team of VfR is called SV Waldhof, not SV Waldorf. 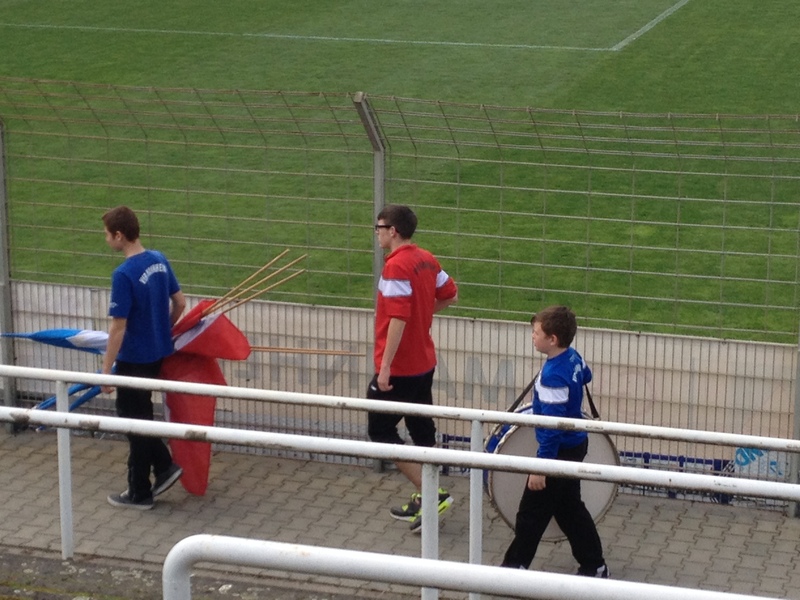 And Neckarau is a district of Mannheim, so only in Mannheim located teams won the Gauliga-Baden.